Winter's cold, snowy kiss will be no match for your hand knit hats. Did you know that a lot of heat escapes from the top of your head? This winter, make sure to stay nice and warm by partnering up with a few knitting patterns for hats. In our new eBook, How to Knit a Hat: 7 Cozy Free Knit Hat Patterns, you'll find 7 hat knitting patterns all designed to keep in the heat with style. That's right; we said the "s" word. If you have any negative connotations surrounding handmade hats, let this eBook prove you wrong. Forgot the bulky, bland, and boring patterns you're thinking of. This selection of prized knits is made for the modern day man, woman, child, and even pet. Dive in and find your favorite go-to patterns within the pages of this collection. Even if you have enough knit hat patterns, why not discover some new inspiration inside this group of all-star tutorials? Before you know it, you'll find yourself feeling the creative urge to knit a gift for a friend this holiday season. Or maybe you'll feel moved to surprise your mom for her birthday by offering her a hand knit hat in her favorite color. Why not really get into the holiday spirit of giving? Use these free knitting patterns for hats to say thank you to your neighbor; after all, you've been borrowing "just a pinch" of sugar and flour from their pantry for years. No matter what gets you inspired to pick up your knitting needles, yarn, and a hat pattern, you'll find a variety of patterns that cater to every skill level inside this eBook. Both advanced and beginner knitters will enjoy making these fall fashions that are winter friendly. These stylish, comfortable hats are ideal for all kinds of cold weather activities like waiting outside for the school bus, building snow forts during recess, or strolling along the sidewalk with your sweetie. This winter, combat the cold in true fashion with this special collection of free knit hat patterns. Each pattern is designed to keep you comfortable, warm and stylish. Whether you’re knitting yourself a hat to fight off the chill of evening winds or if you’re making hats for family members this holiday season, you’ll find a variety of tutorials inside this eBook to suit your needs. I hope you enjoy this group of patterns fit for men, women, children and pets. Download your copy of How to Knit a Hat: 7 Cozy Free Knit Hat Patterns eBook today. For the Kids: Hot Air Balloon Hats (pg. 5): Let's hear it for the kids! This fun group of free knit hat patterns works as mirrors of sorts; each pattern reflects the care-free and playful nature of children in every stitch. For Adults: Day Dream Hat (pg. 12): While life's lessons might tell you that it can be dangerous to day dream too much (at least during work or while you're driving), feel free to release your inner dreamer with this Day Dream Hat. For Adults: Easy Fit Ribbed Hat (pg. 13): Cute knitted hats like this make great gifts for everyone and are easy and fun to make! Embellish it with a flower or pom for feminine flair. Knit this pattern little larger and with a dark wool for the man in your life. For Pets: One Seam Guinea Pig Hat (pg. 16): Where's the joy in knitting hats if you can't make some for the furry little animals in your life, too. Because we like fun (and who doesn't), this free collection also features a One Seam Guinea Pig Hat that's perfect for your favorite little piggy or doll. 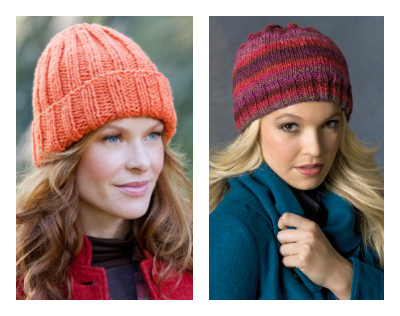 Let AllFreeKnitting help you bundle up for winter with this special collection of knit hats. Give the gift of warmth this holiday season, or simply say thank you to someone special in your life with the group of must-have tutorials in the How to Knit a Hat: 7 Cozy Free Knit Hat Patterns eBook. Stop scouring the internet for free knitted hat patterns and download your free copy of the How to Knit a Hat: 7 Cozy Free Knit Hat Patterns eBook today. Once you subscribe to receive our newsletter, Knit Picky Patterns, you'll see how incredibly rewarding it is to be a part of the knitting community! If you've ever searched for knitting pattern hats, baby hat knitting pattern, or anything in between, let AllFreeKnitting.com deliver quality patterns and ideas from talented designers straight to you! Check out this free eBook and the AllFreeKnitting.com site to draw tons of knitting inspiration! Thanks a lot. I love this web site . I love knitting and I love this website. I feel like a kid in a candy shop when im on here looking for a pattern because anything that i need to knit I can always find on this website. Just love it!!!!! Recently, I never seem to be able to get to the topics you are sending on my email, as for the folliwing: You asked : 25 hard to find things for knitters How can I get to this one? algonac35 - I just googled "knitting patterns for 15 inch dolls" and got a few sites (Knittingpatterncentral.com; Ravelry.com; etc.) just do that. Where am I supposed to find the answer to my comment about asking for a knit pattern for a baby doll pattern? Now to get busyon these hats. I am also looking for a knit pattern (outfit, dress, hat, bloomers, and bootes) for a 15 inch baby doll. Can y ou help me? was this the answer to my question? cynthiadublin -5963935? If so just what does this mean?